While transferring data through many different networks, the source and destination IP addresses are not changed. Only the source and destination MAC addresses are changed. 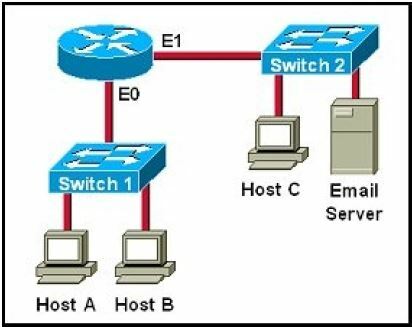 So in this case Host A will use the IP address of Host C and the MAC address of E0 interface to send data. When the router receives this data, it replaces the source MAC address with its own E1 interface’s MAC address and replaces the destination MAC address with Host C’s MAC address before sending to Host C.